This is a fun class where you will create your own unique monster rag doll. Artist Nicci Batillana will guide you through the fun step-by-step process of creating a rag doll using fabric, stuffing and vintage notions. 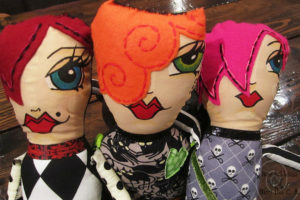 These Spook-a-Delic dolls are made by free form cutting and assembly. No patterns are used! To register call (604) 501-5100 or CLICK here. 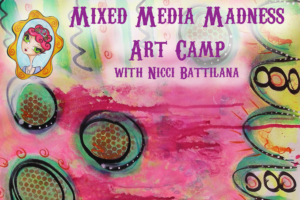 Put thoughts & texture on canvas in this fun mixed media class with local artist Nicci Batillana. Learn how to create tactile paintings on canvas using a large and interesting variety of paints and other media. This creative class is for artists of all levels. Some supplies included. To keep up to date on all of our events LIKE US on facebook! The Creative Finds event planning company was established in 2007 by Nicci Battilana. After working in the Hospitality Industry for over 14 years (specializing in group travel allotment sales for a few of those years) and having been a part of many different public and private venues selling her own creations since 2002, she decided to jump in with both feet and begin organizing her own events. Nicci has learned over the years what helps make a show a success in terms of advertising, location, selecting of vendors/product , and having those extra little treats for your customers and vendors alike to make them feel welcome and appreciated. The Creative Finds Winter Artisan Marketplace ran from 2007 – 2017 and will be back again after a little hiatus, as we focus on our Art Retreats. During our 8th year, we introduced our first annual “Into the heART” Art Retreat! Located in Harrison Hot Springs, BC on the West Coast of CANADA! To make sure that she knew all that she needed to know before taking another big step with organizing 4 day Art Retreats, Nicci attended a well known Art Retreat in the Spring of 2012 as a Student. She then attended night school to obtain her Event Planning certificates (level 1 & 2), which she received in October of 2012 (level 1) & December 2013 (level 2). We respect privacy just like anyone else. Any personal information you provide to us is not shared with anyone under any circumstances. Plain and simple. In connection to any news articles, every effort is made to assure the most accurate reporting is represented in the most honest way possible. If there are any amendments, errors, omissions or anything else of concern either to yourself or anyone else, please notify us immediately and we will assure that the news article is amended in the most appropriate way possible. We are here to state facts and positive ideas and not to mislead anyone.